A few weeks ago there was a bit of hubbub about how a klout score of 55 and higher would earn you an AA one-day lounge pass. At that point my score wasn’t high enough, so I just let it go, until yesterday when I realized my score was 54.49. So close! I still can’t believe how far Canadian Kilometers has come – the people I’ve been able to meet, the support that I’ve had from everyone, the emails I’ve gotten, and the all the … interesting comments that I’ve received. Honestly, thank you everyone for all the support that I’ve gotten and all the help that I’ve been given. Now I have a klout of 55 and as well as a lounge pass, so I’m giving that away, just to thank everyone who has helped me get to where I am. I will be selecting one winner using random.org for those who follow me on twitter and retweets this tweet. I will do this before June 3, so please RT and follow before that (also boost my klout more, haha :P)! 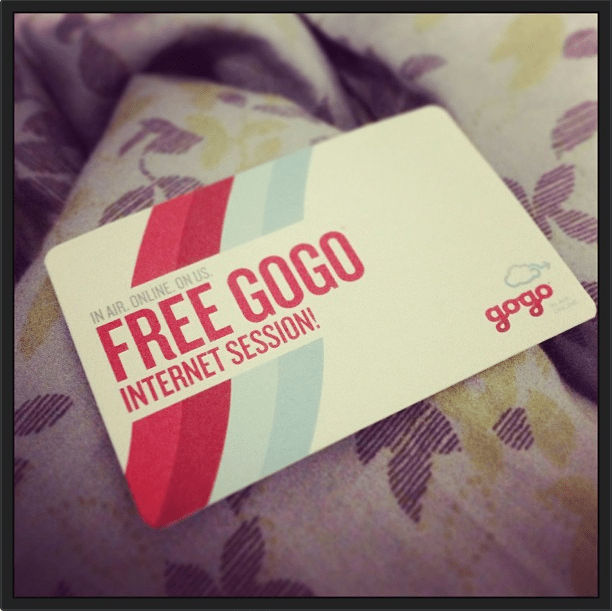 My second item to give away is a Gogo one-time wifi pass for use on a domestic US flight. I got this at BACon, and while everyone has had different experiences and sure there is going to be sides that form with the credit card debate, I found it an immensely amazing experience to not only learn how to be a better blogger, but also a great forum to interact person to person with others in this field. I would say connections are key, especially in this arena given the “secrets” and direct messages that are traded around. I’ve learnt a lot of stuff which I don’t think I would now if it weren’t for the connections that I now have. All of this makes me as excited as ever to continue my journey, to bring a fresh perspective to viewers both north and south of the 49th parallel, and to add my voice into the mix of loyalty and frequent flyer programs. Of course, as I’ve said, I’m not as old as many here, so although I try to know as much as I can, there’s always areas of knowledge that I can brush up on. Please feel free to send me an email (canadiankilometers@gmail.com) to talk about nearly anything, whether it’s a question, feedback about the blog, or even if you want to just chat about miles and points. But the content of the blog can only (hopefully!) improve. So to win the gogo pass, I would like you to comment on this post about content you’d like to see on the blog and what you’d like me to write about. You also have to signup up for emails here (the winner’s comment must have a valid email that is on my list when you subscribe in the link above). I’ll randomly choose a comment by June 3rd and comments must come in before June 2nd 11:59pm Pacific (Daylight) Time. I’m too lazy to make an “official rules” header, so all I’m going to say is that I reserve all rights to modify this giveaway if someone finds a loophole and/or if this goes awry. This post really echoes what I’ve been feeling this month. Thanks again, all of you, for your support and let’s continue on this journey deep into the points and miles world! I’d like you to focus on what you on know about this hobby in Canada. My gf lives in BC and is amazed at what is available for people/me below the 49th parallel. Way of efficiently burning Aeroplan miles are always appreciated, especially in small relatively small quantities (e.g. <30,000), since collecting UA miles is usually a far better deal. I for one really appreciate your contribution. It’s nice to finally have a Canadian perspective in the points & miles game. As another Canadian, I appreciate any and all tips for use and collection of miles in this country! Keep up the great work. Great site, Jeff! Keep it up. If I actually used the tweeter, darn right I’d RT. though based in US, been watching your blog for a while and appreciate all the tips! would be great if you can write more about deals for visitors to Canada as well, for people like me planning trips to the Canadian Rockies and Newfoundland! I am not Canadian but I am really enjoying your blog. Keep up the good work. New to the blog, but am interested to see what you offer for readers south of you. I would agree that some “visit Canada” info would be good. More special fares originating in Canada. If you could offer up content on flight deals to Canada, that’d be terrific. Can you use the pass at the qantas lounge? keep up the good work. I really enjoyed reading your blog like every one else. Kudos to you!